While Apple's felt iPad Pro keyboard cover is a marvel of comfort given the design constraints -- there's nothing like the clicky-clack of mechanical and since I've gotten an office to use as a dedicated writing space I wanted to see if I could get the mechanical keyboard I've used for years with much delight on my Mac to work with the iPad Pro. I'm using and highly recommend the WASD V2 87-key keyboard. It has Cherry MX Blue key switches without sound damping (go big or go home) to give in that classic keyboard feel. The layout has full-sized arrows and page-up/down keys for text navigation but cuts the needless bulk of a numberpad on the side. You can customize the color of the keys and what's printed on them (Dvorak layout, anyone?) or just go all in on the evil-empire look. Another feature of the WASD is underneath the keyboard are switches to change the behavior of the keyboard. Flipping switch one puts the keyboard into Mac-mode: making the key next to the spacebar act as the ⌘ key. Flipping switch six converts the insertpad keys into music/media control keys when used with the FN key. There aren't any iPad stands designed to work with the iPad Pro at the time of this writing. But the CTA Digital 2-in-1 Kitchen Mount Stand stand is just barely big enough to grip the iPad Pro, though the arm isn't strong enough to actually hold it off of the surface. If you just need something to prop the iPad Pro up on something else, it'll do. But the grippers are pretty damn ugly and medical looking. Combining the keyboard, the adaptor, plus the stand gets a pretty great dedicated writing environment. But could we go farther? Turns out yes: the Nulaxy USB to Bluetooth converter eliminates the need to connect the keyboard to the only lighting port -- which in turn means that the iPad can simply be left plugged into power constantly with no need to switch wires before writing. And thus an ugly wire is eliminated. The Nulaxy has to be turned on and off manually otherwise it'll run down the AAA batteries. Over Bluetooth, the insertpad-as-media-keys trick doesn't work. ⌘-SPACE: Brings up spotlight search in which you can use the arrows to navigate. ⌘-TAB: Brings up the app switcher. Tap TAB to move forward and SHIFT-TAB to move backward. Lastly, to find even more shortcuts: hold down ⌘ in any app to see the keyboard shortcuts available. For the past several months I've been trying out 2Do as my task manager. While there are many complicated reasons for my tentative, and possibly temporary, move away from OmniFocus the main reason for the switch is templates. As explained on the Cortex podcast I run my whole life as a series of checklists, which was only possible with OmniFocus on the Mac and only with now-abandoned 3rd party software. Looking for replacements on iOS yielded exactly one: 2Do. While it doesn't have native template support, it does have a decent plugin for Workflow which allowed me to write a template creation script on iOS. Where $variable is the name of the video. After the second pipe can come any number of tags separated by commas. The final two pipes are for defining variable start and due dates. When the template runs it asks for a project due date. The first number is how many days before the project due date the individual task should be due. The second number is how many days before the project is due. This can also be replaced by a NULL (as shown in the template) to give the task no start date so that it is immediately available. When run, the script defaults to dumping all the tasks and the project into a list called 'Templates'. This allows you on iOS to easily bulk move all the tasks into the project and them move the project to wherever you want in your system. Discuss this article on the reddit. I've always found editing scripts by hand to be useful. But getting typed words onto physical paper to actually edit always incurred resistance: difficult printers, paper and toner supplies, pens running short of ink, to say nothing of the need to plan ahead. For a while I had a script that automatically printed my active writing projects in the morning so I could grab them and go. But it was wasteful and unreliable. Each OS X update brought new trouble and I eventually abandoned the project -- reserving handwriting for only the most dire of situations. But the Apple Pencil and iPad Pro changed that. Now with the press of a button in Editorial I can spit out a triple-spaced PDF, open it up in Goodnotes and be editing by hand in seconds. No planning ahead required -- now any cafe table or train cabin is just as good a place to handwrite as to type. Given my past technological cheerleading, it may surprise some how much I value working with messy handwriting and clumsy arrows. Writing by hand mode-shifts the brain. A keyboard under the fingers makes it easy to add more and more -- the click of the keys is the wind at your back. But the constraints of the printed page make adding indefinitely an impossibility, while subtracting is simplicity, slashing is satisfying. The blank page needs filling, but: concision improves writing. Growing and cutting are the horticultural cycles of writing. Keyboards grow, pen(cils) cut. Both are needed to shape as desired. 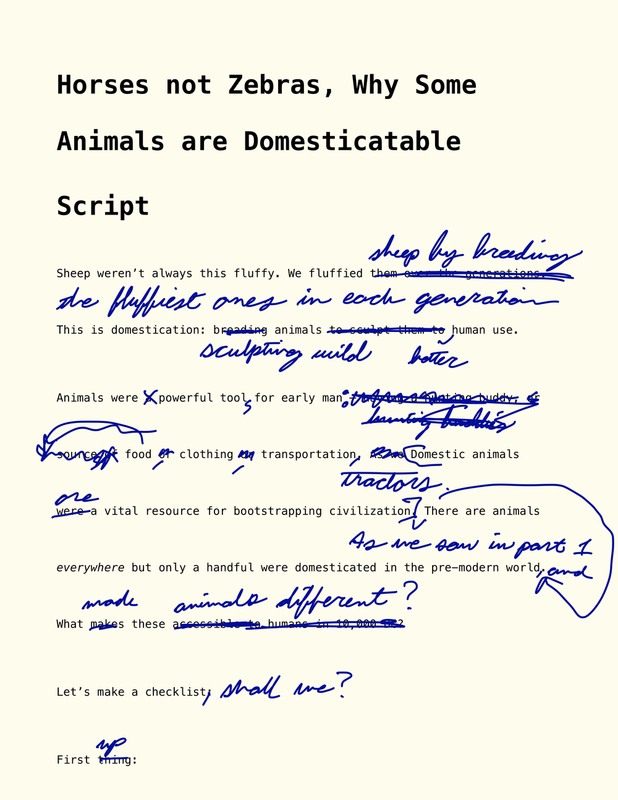 If you write anything that matters (school essays where the goal is length and obfuscation excluded) I suggest you give hand-written drafts a try -- with an ink pen or a digital pencil. Long before my independent career began, I read Stephen King's book On Writing in which he showed a draft of a short story he edited by hand. To see the nitty-gritty details of how a writer changes his work a younger me found enlightening. In that tradition, I've included below a draft of Zebra vs Horses as it was about two weeks before release. If you, like younger me, are interested in how such things are slowly shaped, watch the video, then read the script. You'll see how it isn't yet the final product and how the edits bring it closer. If you're interested in seeing more of my drafts, I'll be releasing more over at Patreon.